The defending NCAA champion Texas Longhorns have officially kicked off the 2016-17 season, gathering at their home pool today for their annual Orange vs. White intrasquad meet. This season, it was the white team who came out ahead, winning 10 events to leave the final score at 154-120. Among the orange team standouts was U.S. Olympic gold medalist Jack Conger, who’s now competing in his senior season with the Longhorns. Conger swept the butterfly races, first winning the 100 in 45.47 before going on to clock a winning time of 1:42.40 in the 200. Sophomore Townley Haas, who earned an Olympic gold alongside Conger on the 800 free relay, won the 200 free to start the season with a 1:36.77. Haas also swam to 2nd in the 500 free, posting a 4:25.62. Winning that event was the white team’s Clark Smith, another gold medalist from the 800 free relay this summer. Smith doubled up in the distance free races, winning the 500 in 4:18.98 and the 1000 in 9:15.48. While his overall time wasn’t fast by his standards, he did split a 22.3 in the last 50 yards of the swim. Also picking up double event wins for the white team was sprinter Brett Ringgold, who won the 50 (19.86) and 100 (43.55) freestyles. Notably absent from the meet today was Joseph Schooling, who returned for his junior season with the Longhorns after winning an Olympic gold medal in the 100 fly this summer. Schooling and Conger have been known to push each other in the fly races, having gone 1-2 in both fly races at 2015 NCAAs, and 1-2 in the 200 fly at 2016 NCAAs. In each of those races, they were separated by 0.12 or less. Senior Will Licon, the reigning NCAA 200 breast and 200 IM champ, was also missing in action. Swimming news courtesy of Texas Swimming & Diving. AUSTIN, Texas – Team White collected 10 victories en route to a 154-120 victory over Team White Friday afternoon in the Longhorns’ annual intrasquad meet at UT’s Lee and Joe Jamail Texas Swimming Center. Sophomore John Shebat opened the meet with an easy win in the 100-yard backstroke at 47.33 seconds while sophomore Preston Varozza took second at 48.96. Sophomore Casey Melzer picked up a tight win in the 100 breaststroke at 55.55 while junior Austin Temple followed closely behind at 55.77. Senior Jack Conger, a U.S. Olympian and American record holder in the 200-yard butterfly, posted an impressive mark in the 100 butterfly and cruised to victory in 45.47. Fellow senior Will Glass followed in second at 47.75. U.S. Olympian Clark Smith led from wire-to-wire in the 1000 freestyle and was victorious for the White team in 9:15.48. 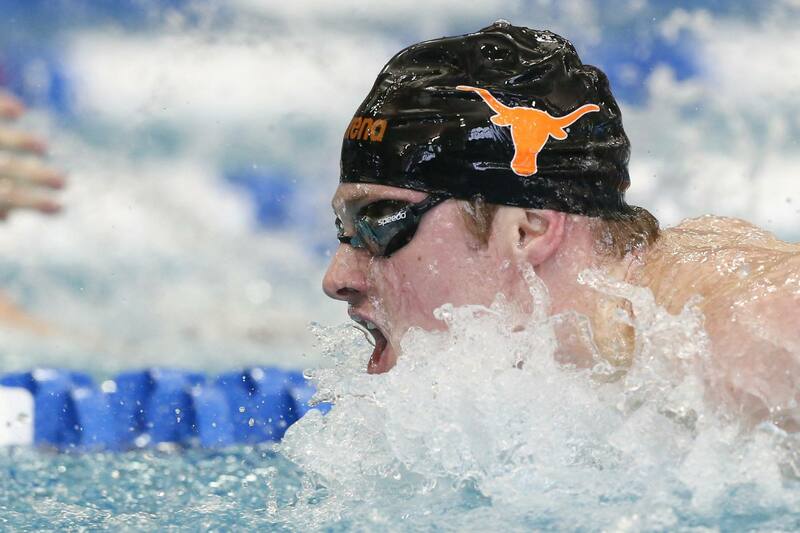 His U.S. Olympic teammateTownley Haas notched a win for the Orange team in the 200 freestyle, an event in which he holds the NCAA and American records. Haas won in 1:36.77 while senior P.J. Dunne took second at 1:37.21. Junior Brett Ringgold scored a win for the White team with his mark of 19.86 in the 50 freestyle. Sophomore Sam Stewart, an Auburn transfer, claimed the 200 IM for the White team at 1:49.31, just ahead of the second-place mark of 1:49.59 fromJared Butler. Conger returned to post his second win of the day in the 200 butterfly at 1:42.40, and Ringgold registered his second win with a 43.55 in the 100 freestyle. All-America junior Jonathan Roberts posted a 1:47.15 to win the 200 backstroke for team White. The 500 freestyle featured the last two NCAA champions in the event, as Smith, the 2015 NCAA champion, took the win at 4:18.98. Haas, the defending NCAA champion, took second at 4:25.62. All-America senior Mark Anderson, a two-time Big 12 Diver of the Year, edged freshman Grayson Campbell to claim the one-meter diving event with 319.72 points. Campbell totaled 316.27 points for second. Freshman Jacob Cornish captured the three-meter event for the White team with 313.05 points. Melzer added a victory in the 200 breaststroke at 2:00.90, and the White team finished off the meet with a win in the 400 freestyle relay at 2:56.87. Uh, Clark Smith split a 22.3 last 50 of his 1000? Clark is a monster swimmer, if only he conquers the monsters between the ears. IMO, coming from personal experience. I guess Jonathan Roberts and Sam Lewis were sick too… Didn’t they make A Finals at 2015 NCAA?